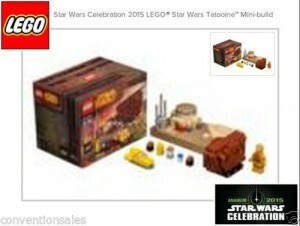 It looks like LEGO’s Exclusive for Celebration Anaheim has unofficially leaked on eBay. Thanks to a tip from Groovebricks & “Just2Good”, we get a blurry look at a Mini Lars Homestead scene that includes a Microfighter-like Sandcrawler, a mini version of the Lars Homestead, mini Landspeeder, 5 micro figures (R2, C-3PO, Luke, Jawas x2) and a standard minifigure of C-3PO. No word as of yet as to an official cost, but as imagined, it is already demanding quite a premium on eBay. Head on over to Groovebricks for a closer look.